Yesterday the BBC unveiled the BBC MicroBit, which is a system-on-a-chip-on-a-card (powered by a Cortex M0) similar to the Raspberry Pi or Arduino. With a size of 4cm by 5cm it's pocket sized, and unlike the Raspberry Pi has an adaptor that allows it to be powered by a pair of AAA batteries, allowing the device to be powered whilst on the move with easily available power. It can also be powered, as well as programmed, through the micro USB connector. The low power requirements or 3V are significantly different from the Raspberry Pi or Arduino which typically require either a regulated 5V USB supply or a 7V+ supply for portable use. Unlike the Raspberry Pi, but similar to the Arduino, there is no display output. Instead the device has a 5 by 5 LED arrangement on one side, which can be used to present simple character graphics and even scrolling messages. There are two user programmable buttons, but where it really excels is through its connector edge that has 3 digital/analogue input pins that are wide enough to accomodate a crocodile clip. This takes its cues from devices (like the Makey Makey) where allowing connectors to be hooked up with a crocodile clip make it much easier to experiment with for younger children. (The Raspberry Pi has male pins which are very closely spaced; the Arduino Uno has female sockets which are similarly closely spaced - although there are other Arduno deviecs such as the Lily which have connectors suitable for clips.) There are also an additional 20 pins which are likely to require connecting with an edge connector, likely as an aftermarket option. The BBC MicroBit will be given to 1 million UK children in October, and units will also be available for purchase through distributors towards the end of the year. 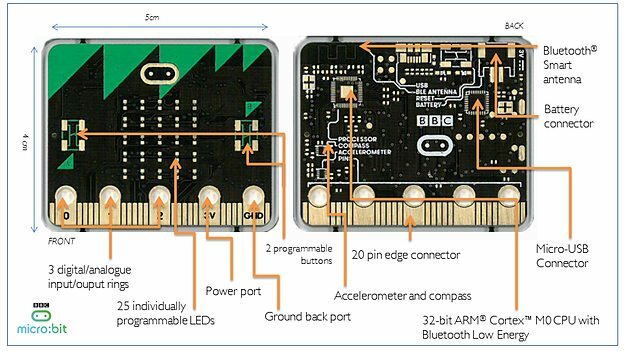 The goal of the MicroBit is to give a tangible device that can be carried and attached to mobile projects, or even as a daughter board for a Raspberry Pi or Arduino, as well as teaching programming language skills.